British prime minister, Harold Macmillan, was once asked what was the most difficult thing about his job. ‘Events, dear boy, events’ was his now famous reply. Put more colloquially, and much less elegantly, stuff happens and politicians have to deal with it. Things that happen can transform the political landscape, for better or worse, in a flash as Margaret Thatcher discovered in 1982 when Argentina invaded the Falkland Islands. Her successful response to this event transformed a looming electoral defeat into victory. Analysis is a far less insistent driver of politics. Governments can, and often do, ignore analysis, even to the point of disaster. Successive US governments were warned time and again by intelligence analysts that they were losing the war in Vietnam. But this was never enough to stop the war. One unmanned Sputnik briefly circulating the planet was, however, enough to release billions of dollars into the successful American effort to put a man on the moon. Until the unfortunate climate summit in Copenhagen in 2009 the politics of climate change was primarily driven by analysis. The Intergovernmental Panel on Climate Change (IPCC) was set up by governments in 1988. Its job is to advice the 120 participating governments on the science of climate change. In the subsequent 26 years it has published five assessment reports based on the published scientific literature on climate change. Its summary for policy makers is agreed line-by-line by governments and has so far led to climate legislation in 66 countries. Each report has increased confidence in the science of climate change and alerted politicians to the magnitude and urgency of the issue. Copenhagen, however, revealed the depth of the political difficulty of taking their advice. Combined with the aftermath of the banking crisis, this led to a significant lowering of climate change on the agenda of global leaders. This decline has now been reversed. Among the global leaders who have already put their mark on the issue in the run up to the climate summit in Paris in 2015 are President Obama, President Xi, Chancellor Merkel, President Hollande and Secretary-General Ban Ki Moon. It is not new analysis that has led to the restoration of climate change to the leaders agenda. This has simply reinforced what we already know. It is events, in particular two successive years of extreme weather events all over the world, that are now drawing political leaders back to the issue. Hurricane Sandy in October 2012 was the most dramatic of a series of extreme weather events that have occurred over the past two years. It inflicted some $68 billion worth of damage to the United States and produced the extraordinarily rare sight of a prominent Republican praising President Obama. But Sandy was only a precursor to an exceptional year of extreme weather events in every part of the world. Temperatures were so high for so long in Australia in 2013 that the weathermen had to add an extra colour, purple, to the weather charts to warn of the dangers of extreme heat. The summer of 2014 has been even hotter. In the same year China had its wettest May for forty years; California recorded the hottest temperature, 54C, ever recorded anywhere on earth; there was another drought in Brazil; the strongest typhoon ever to strike land devastated the Philippines and Bangladesh recorded its lowest ever temperature. Parts of the UK are still underwater three months after the St Jude storm began an eight week period of continually violent weather. This is only a partial list of the weather extremes in 2013. Such events are natural occurrences. But not extreme weather events, everywhere on the planet, in the same year. 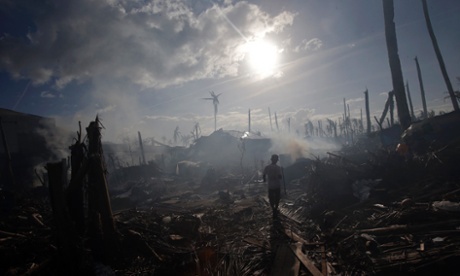 These events contributed to an overall loss of about $125 billion in 2013 from natural catastrophes. They are a powerful reminder of the chapter headings in an early James Bond novel: ‘Once is happenstance, twice is coincidence, three times is enemy action.’ It is now clear that we are seeing the beginning of ‘enemy action’ by the climate as it responds to an increased burden of carbon in the atmosphere. The changes we are seeing today are a result of the carbon burden we had added by the end of the seventies. This has increased global average temperatures by 0.8C. If we continue our current dependence on fossil fuels we could find ourselves in a world that is more than 2C warmer before the middle of the century. Much of what is today considered an extreme weather event may by then be the new normal. In the face of this onrushing flood of events those politicians still subsidising the use of fossil fuels resemble nothing so much as a forlorn, and dangerously irrelevant, King Canute trying to hold back the tide.